This article is about the doctor persona of Mario. For the game, see Dr. Mario (game). For an overview of the series of games under the Dr. Mario label, see Dr. Mario (series). Dr. Mario is the persona Mario takes in the Dr. Mario series. Under this identity, Mario dons a lab coat, a head mirror, and a stethoscope around his neck. He first appears in his titular game, Dr. Mario. Dr. Mario and Nurse Toadstool, his assistant nurse, work at the Mushroom Kingdom Hospital, where Dr. Mario eliminates Viruses and other diseases by using Megavitamins, which has been the standard for subsequent games starring him. Dr. Mario also appears as an unlockable fighter in Super Smash Bros. Melee, Super Smash Bros. for Nintendo 3DS / Wii U, and Super Smash Bros. Ultimate, where he is considered a separate character from Mario. Dr. Mario, as seen in his titular game. In Dr. Mario, Dr. Mario works in a virus research lab at the Mushroom Kingdom Hospital, alongside Nurse Toadstool. When an experiment goes wrong, the hospital is flooded with tri-color viruses. Armed with Megavitamins - a medicine of his own invention - Dr. Mario sets out to neutralize the outbreak. 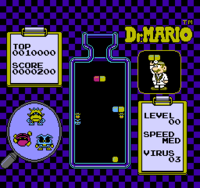 In gameplay, Dr. Mario periodically throws Megavitamins into the bottle. Afterwards, the player can move and land them on Viruses, which spawn throughout the bottle. By connecting a line of three or more halves of Megavitamins to a virus of the corresponding color, the Virus disappears. As such, blue Megavitamins eliminate Chill Viruses (blue), red Megavitamins eliminate Fever Viruses (red), and yellow Megavitamins eliminate Weird Viruses (yellow). Removing all viruses on the screen advances the player to the next level. In Dr. Mario 64, Mad Scienstein robs Dr. Mario's Megavitamins and sets off to deliver them to his master, Rudy. Dr. Mario, as well as Wario, who wants to sell the Megavitamins for money, follow the two. In order to advance through the story, Dr. Mario must defeat Rudy's minions in Vs. Matches. In the end, it is revealed that Rudy is actually sick and Scienstein was ordered to retrieve the magical healing pills to cure him. Dr. Mario also received several subtle aesthetic changes, most of them reflecting Mario's changes over time. In particular, he gained a tie, which has since become a staple of his design. Dr. Mario, as seen in Dr. Mario Online Rx. In the WiiWare game Dr. Mario Online Rx, players can control Dr. Mario or any Mii stored in their Wii. 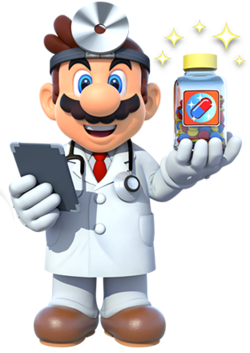 Dr. Mario serves a similar role as his debut game; he takes Megavitamins from his bag and throws them into the bottle, using them to defeat viruses. In the DSi game Dr. Mario Express, he plays the same role as he does in Dr. Mario Online Rx, but unlike the Wii version, his model is cel-shaded, giving him a more cartoonish look. Dr. Mario, as well as his brother, Dr. Luigi, appears in the compilation in Dr. Mario: Miracle Cure, which includes "Dr. Mario", the standard gameplay where Dr. Mario assists players destroy viruses, as well as two additional modes, "Operation L" from Dr. Luigi, and "Virus Buster". One new clearing method Dr. Mario can use is the Miracle Cure, which is a gauge that, once filled, can be used to destroy all Viruses and Megavitamins of the corresponding color, drop a bomb to remove adjacent Viruses and Megavitamins, or clear an entire column. Dr. Mario on a cover of Nintendo Comics System. 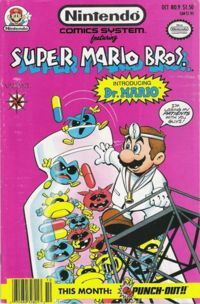 Dr. Mario appears in Nintendo Comics System's adaptation of Dr. Mario, entitled "The Doctor Is In... Over His Head". Mario and Princess Toadstool, expecting a plumbing emergency, enter the Mushroom Kingdom General Hospital, although they find no emergency. Dr. Waldo Bloom insists so and makes Mario his research assistant, calling him Dr. Mario. After touring through the hospital, Dr. Waldo takes them to his laboratory where he shows them the Viruses, and he explains that the Viruses have been multiplying. The original Viruses, inside the jar, soon break free and introduce themselves as Chill, Fever, and Weird. Eventually, after discovering that matching the colors of stacked Megavitamins can destroy Viruses, Mario manages to defeat them. Princess Toadstool then advises Dr. Bloom play golf and return only he is done with the game, but Mario notes that Dr. Bloom is a bad golfer, which means Dr. Bloom will be off duty for a long time. Princess Peach then suggests Mario to be both a plumber and a doctor, which Mario agrees to do. Dr. Mario also appears in the German Club Nintendo comic "Süße Weihnachten" where he helps Bowser who suffers from a stomachache on Christmas Day. Bowser has Viruses in his stomach, and Dr. Mario advises him to take bitter pills instead of marzipan. Dr. Mario in Super Mario-Kun. Dr. Mario makes a brief appearance in volume 1 of Super Mario-Kun, in which Yoshi falls from the Sky and Mario then transforms into Dr. Mario before stuffing a giant Megavitamin in his mouth. Dr. Mario reappears in volume 8, after being attacked by a Tweeter, Mario transforms into Dr. Mario. He then reveals a shell underneath a rock and attaches rocket boosters (which resemble Megavitamins) to it, enabling him, Luigi, and Yoshi to fly on it. This knocks away nearby Snifits. A wall of Megavitamins appear, and Dr. Mario is shown contemplatively holding his forehead before appearing surprised as they disappear. Artwork of Dr. Mario from Super Smash Bros. Melee. Dr. Mario appears as an unlockable fighter in Super Smash Bros. Melee. He is unlocked by beating Classic or Adventure mode with Mario without losing any lives or by playing 100 Melee matches, and then defeating him in the immediate subsequent match on Princess Peach's Castle. 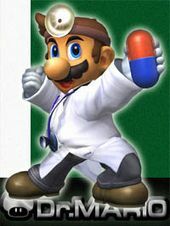 Unlike in his home series, Dr. Mario's design is somewhat modified for his appearance in Super Smash Bros. Melee, with the most noticeable change being a pair of dark gray pants. Dr. Mario's weight is 100 units, similar to Mario. According to Masahiro Sakurai, the creator of the Super Smash Bros. series, the concept of a slower, yet stronger Mario was originally considered to be used for Wario. Due to time constraints, however, this concept was instead given to Dr. Mario. The overwhelming majority of Dr. Mario's moves are nearly identical to his normal self's, although his attacks nevertheless have a few distinct traits. In addition to his aforementioned higher strength, Dr. Mario throws Megavitamins instead of Fireballs; his forward smash uses electricity instead of fire; he uses the white-colored Super Sheet instead of the Cape; and his Super Jump Punch is stronger, but hits a fewer amount of times. Contrary to his trophy's description, Dr. Mario's jump height and running speed are actually the same as Mario's; additionally, his air speed is faster than his regular counterpart's. Although Dr. Mario is absent from Super Smash Bros. Brawl as a playable character, data for Dr. Mario can be found, suggesting that he was intended to be in the game in some form. Meanwhile, his Super Smash Bros. Melee theme can be used as one of the songs that plays in the PictoChat and custom stages. He also has a Sticker depicting his artwork from the original Dr. Mario game. Dr. Mario returns in Super Smash Bros. for Nintendo 3DS and Super Smash Bros. for Wii U as an unlockable fighter, along with fellow cut characters from Super Smash Bros. Melee Mewtwo and Roy. Unlike Mewtwo and Roy, however, he is included with the initial release of the games, whereas Mewtwo and Roy are available as DLC fighters. To unlock Dr. Mario in the Nintendo 3DS version, players must either complete Classic Mode with Mario on at least 4.0 intensity, or play 60 Smash matches. Afterward, the player must defeat him on Mushroomy Kingdom. In the Wii U version, players can unlock Dr. Mario by completing a Master Orders ticket with a difficulty level of Hard or higher, or by playing 50 Smash matches. Afterward, the player must defeat him on Delfino Plaza. Dr. Mario's design is now a composition of his appearance as of Dr. Mario 64 and his dark gray pants from Super Smash Bros. Melee. To reflect this change, Dr. Mario can wear tie equipment to boost his defense stat instead of the overalls equipment his normal self uses. However, he also uses the gloves and shoes equipment for attack and speed like Mario does. Unlike in Melee, Dr. Mario now functions like a stronger, yet slower Mario. Almost all of his moves deal 1.12× more damage than Mario's; conversely, his base ground mobility is Mario's multiplied by 0.832, and his base air mobility and base jump/double jump heights are Mario's multiplied by 0.808. These multipliers result in Dr. Mario being distinctly affected by passive equipment physics, in which he specifically possesses a +15 Attack value and a -50 Speed value. Dr. Mario's weight, like Mario's, is decreased to 98 units. Dr. Mario retains his moves from Melee, while custom versions of his neutral, side, and up special moves are shared with Mario. However, the custom versions of Dr. Tornado are instead shared with Luigi, owing to Mario having F.L.U.D.D. as his down special move since Super Smash Bros. Brawl. Dr. Mario's Final Smash, Doctor Finale, is a variation of Mario's Mario Finale that is stronger and uses giant Megavitamins instead of giant, streaming fireballs. Dr. Mario has also gained two new taunts, new idle animation, a new entrance animation, and a new victory animation that replaces the victory animation he shared with Mario in Super Smash Bros. Melee. Dr. Mario returns as an unlockable playable character in the Super Smash Bros. Ultimate. He retains many of his moves from the previous installment; however, his down aerial has changed from a corkscrew dropkick to a double foot stomp, which is capable of meteor smashing an opponent. Dr. Mario also receives a new back throw, which is an overhead swing. Dr. Mario's side special, Super Sheet, has a new animation distinguishing it from Mario's Cape where he swings the sheet upward, but is otherwise functionally unaltered. Dr. Mario's walking and running speeds are slightly increased, but at the cost of lower jumps and air speed, but his traction is slightly higher; the entirety of his moveset receives a slight damage increase. Additionally, his grab animation is now one-handed like with Mario. Dr. Mario's multipliers are also altered, having +22 attack and -65 speed, still using equipment as a reference. Dr. Mario benefits from many universal changes: his mobility is faster; his short hop timing is reduced; his recovery is extended by the reintroduction of directional air dodges; his landing lag in his aerials has been decreased; he can use any ground attacks out of a run and use any aerial attack while holding on the ladder. Several of Dr. Mario's standard attacks receive nicknames: up smash is Ear, Nose, and Throat; standard aerial is Dr. Kick; forward aerial is Dr. Punch; down aerial is CLEAR! ; and down throw is Hospital Bed. Dr. Mario's Classic Mode route involves him fighting red-, yellow-, and blue-colored variants of different characters, as a reference to the viruses from the Dr. Mario games. Dr. Mario also makes a small appearance as one of the occupations listed in Super Mario Bros. & Friends: When I Grow Up on the "Medical Doctor/Nurse" career page. In WarioWare, Inc.: Mega Microgame$!, Dr. Mario appears in a microgame named after him based on the NES version of his game. A spoof of the original Dr. Mario game appears in WarioWare, Inc.: Mega Microgame$! called Dr. Wario, though it has no gameplay differences. Yet another microgame in WarioWare Gold stars Dr. Mario. Dr. Mario in Super Mario Maker is also one of the several characters that compose Costume Mario. Players can unlock the Dr. Mario costume by using the appropriate amiibo or complete one of the several challenges, which randomly unlocks a costume character. When players use Dr. Mario, sound effects from the NES version of Dr. Mario play, and when is pressed, Dr. Mario takes out a Megavitamin. One of Yoshi's designs in Yoshi's Woolly World is based on Dr. Mario. Players can scan a Dr. Mario amiibo to unlock the color scheme. Later, in the animated Super Mario World TV show episode "King Scoopa Koopa", Mario finishes off his healthy-eating request to a group of cave people with the line "Dr. Mario's orders!". Dr. Mario was given a similar reference in Paper Mario when the thankful Whale told Mario that he should be addressed by the title of "Dr. Mario" after Mario and his partners expelled the Fuzzipede from the Whale's body, thus ending his stomachache. 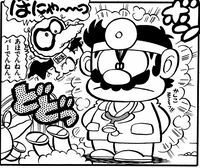 Dr. Mario also makes a short appearance in one strip of Super Mario 4koma Manga Theater. Here, he receives a patient, which turns out to be a Dry Bones, much to his annoyance. In Nintendo Monopoly, Dr. Mario is seen on the "Receive for medical services $25" ? Block Card. In Super Mario Odyssey, Dr. Mario appears as one of Mario's outfits. Dr. Mario has also appeared in the various remakes and compilations of several games. Dr. Mario Vs. which was made for Vs. matches of Dr. Mario, released for the Nintendo Vs. System. Tetris & Dr. Mario is a remake of the NES game, and, as shown in the title, also includes Tetris. Dr. Mario BS Version is a remake of the original game for the Satellaview that includes the graphics and sound from Tetris & Dr. Mario. Classic NES Series: Dr. Mario is a direct port of the original Dr. Mario, it was one of the many NES games remade for the Classic NES Series on the Game Boy Advance. Also for the Game Boy Advance, Dr. Mario & Puzzle League featured Dr. Mario alongside an unrelated game, Puzzle League in a similar fashion to Tetris & Dr. Mario. Lastly, Nintendo Puzzle Collection includes Dr. Mario 64 as part of the collection of Nintendo puzzle games. Dr. Mario is a fair-skinned man with brown hair and a brown, ragged mustache, similar to his normal self. 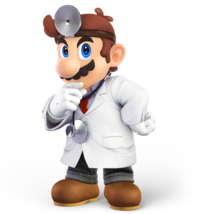 Dr. Mario also wears brown work shoes like his normal self, but he dons a doctor's regular form of attire: white pants, a white collared shirt, a red tie, and a white coat, as well as a stethoscope. Despite this, Dr. Mario's design has undergone several changes throughout his history. In his first self-titled game, Dr. Mario lacks a tie, his shirt is a darker color, and his hair is distinctly lighter than Mario's. In Dr. Mario 64, Dr. Mario's hair is closer to Mario's in color (though still a lighter shade of brown), while he now wears his signature tie. From Dr. Mario Online Rx onwards, Dr. Mario's design remains the same. Within the Super Smash Bros. series, Dr. Mario's appearance also evolves. In Super Smash Bros. Melee, Dr. Mario has auburn hair and a tanned complexion, reflecting his then-recent appearance in Dr. Mario 64, as well as Mario's appearance in Mario Kart 64. Dr. Mario's hair and clothing have more realistic details, while his pants' color is changed altogether. In Super Smash Bros. for Nintendo 3DS / Wii U, Dr. Mario's hair is brown like Mario's, while his overall design is more vibrant and cartoonish; however, he retains his unique gray pants. In Super Smash Bros. Ultimate, Dr. Mario gains a subdued color scheme, while his hair and clothing regain some simple detailing. Dr. Mario has eight selectable costumes in the Super Smash Bros. series, including his default appearance. Dr. Mario's first alternate costume consists of a green shirt, lime green tie, red coat, light gray gloves, and gray shoes, which is the attire worn by modern nurses. Dr. Mario's second alternate costume consists of a blue shirt and gray gloves, as well as a dark blue tie, which is the attire worn by modern doctors. Dr. Mario's third alternate costume consists of green gloves, shirt, tie, and coat, resembling what modern surgeons wear. Dr. Mario's fourth alternate costume consists of fully black attire, save for the red tie, nicknamed the "Unlicensed Doctor." Dr. Mario's fifth costume consists of a yellow coat, green shirt, dark green tie, and gray gloves, borrowing some elements from his red costume. Dr. Mario's sixth alternate costume consists of a purple coat, maroon gloves, orange shirt, and red tie, having no specific inspiration. Lastly, Dr. Mario's seventh alternate costume consists of purple shoes, a pink coat, lavender shirt, and teal tie, being inspired by Nurse Toadstool's colors. Like his normal self, as well as Luigi, Wario, and Waluigi, Dr. Mario is voiced by Charles Martinet. Dr. Mario speaks with a strong Italian accent, similar to his normal countpart. However, Dr. Mario is considerably less vocal than Mario, which is apparent in the Super Smash Bros. series, having less quotes and battle yells. Text-based dialogue-wise, he speaks in Dr. Mario's instruction manual, as well as the Nintendo Comics System, Super Mario-Kun, and Super Mario 4koma Manga Theater. Within the Super Smash Bros. series, Charles Martinet's portayal of Dr. Mario varies. In Melee, Dr. Mario uses Mario's Super Mario 64 voice clips, resulting him in higher-pitched voice; Dr. Mario also utters some words such as "Yahoo!" and "Here we go!". In 3DS / Wii U and Ultimate, Dr. Mario speaks with Mario's current tone, though it is considerably deeper than in the previous Mario games, a trait Mario also shares. Medical Doctor/Nurse Dr. Mario and Nurse Princess Toadstool are using the X-Ray machine to find out what is wrong with their patient. "Aha! This patient's bones aren't connected," says Dr. Mario. "No wonder he looks so sick." Medical doctors take charge of treating the sick to save lives and relieve suffering. Doctors know almost everything about the human body and specially trained in preventing and treating disease. Nurses help doctors in clinics, hospitals and doctor's offices. Some nurses have special training which allows them to examine patients and prescribe treatment. Immaculate in his medical garb, Dr. Mario destroys killer viruses with his amazing vitamin capsules. With his dedicated nurse, Princess Peach, at his side, Dr. Mario spends day and night in his laboratory working on new miracle cures. Somehow he's managed to keep up with all the new viruses that have arisen over the years. There's hardly any difference in the abilities of Mario and Dr. Mario, so choosing is largely a matter of taste. Dr. Mario is a tad slower due to his lack of exercise, but his Megavitamins pack a bit more punch than Mario's Fireballs. The capsules travel on a unique trajectory and make a distinct sound on impact. The differences between Dr. Mario and Mario are more pronounced in some areas than others, but basically they can be played in a similar fashion. While it may be hard to spot the contrasts, they do exist. For example, Dr. Mario's Super Sheet is longer and narrower than Mario's cape, and any opponents hit by Dr. Tornado will fly off in diverse directions. Wii Dr. Mario Online Rx (05/2008) In the 1990 puzzle game Dr. Mario, Mario threw on a white coat and decided to take a shot at that whole "medicine" thing. In this game, he's a balanced fighter who can throw Megavitamin capsules and nimbly deflect blows with his Super Sheet. He's not quite as quick as normal Mario, but his attacks deal a bit more damage. In Dr. Mario, released in Europe in 1991, Mario threw on a white coat and decided to have a bash at the whole medicine thing. In this game, he's an all-rounder who can throw Megavitamin capsules and nimbly deflect blows with his Super Sheet. He's not quite as quick as normal Mario, but his attacks deal a bit more damage. Wii Dr. Mario Online Rx (05/2008) Mario and Dr. Mario are only slightly different. Basically, Dr. Mario is stronger, but his MD slows his speed and lowers his jump. He also has a move Mario doesn't: Dr. Tornado, a down special that can trap opponents before launching them. You can move left and right while doing it and press the button repeatedly to rise into the air. Mario and Dr. Mario are only slightly different. Basically, Dr. Mario is stronger, but his heavy coat affects his speed and jumping. He also has a move Mario doesn't: Dr. Tornado, a down special that can trap opponents before launching them. You can move left and right while doing it and press the button repeatedly to rise into the air. In Dr. Mario's Final Smash, he spreads his arms wide and then lets loose a pair of giant vitamin capsules that spiral through the air, taking out any pesky "viruses" in their path. The wide range makes it tough for foes to avoid, and opponents they strike will take multiple hits, and possibly even being pushed right off the screen! Pit: I don't think that's a real doctor. Palutena: I wouldn't be so sure. He delivers crushing blows, so he must be very knowledgeable about anatomy. Viridi: He's a quack. I hear he treats viruses by randomly throwing medication at them. Doesn't seem very safe. Pit: I'm so glad Skyworld doesn't have checkups. Palutena: Dr. Mario is slower than the regular Mario, but he's also more powerful. Don't get sent to the emergency room! You don't know what kind of treatment you'll get. 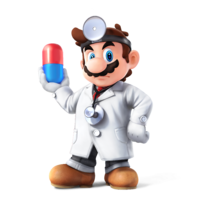 In the 1990 Dr. Mario game, Mario threw on a white coat and decided to take a shot at that whole "medicine" thing. Dr. Mario destroys killer viruses with his amazing vitamin capsules and spends day and night in his laboratory working on new miracle cures. Somehow he's managed to keep up with all the new viruses that have arisen over the years. For this subject's image gallery, see Gallery:Dr. Mario. ↑ "I'm Mario. How's it going? Over the last few years, I've been involved in some pretty wild adventures. Now, believe it or not, I work in the virus research lab at the Mushroom Kingdom Hospital." Dr. Mario instruction manual for NES, page 3. ↑ "One of the experiments has gone out of control. The viruses are spreading quickly!" Dr. Mario instruction manual for NES, page 3. ↑ "I have just developed a new vitamin that should be able to take care of it. I sure hope this stuff works!" Dr. Mario instruction manual for NES, page 3. This page was last edited on April 8, 2019, at 21:00.